The Three Gorges Dam in China is the world’s largest hydroelectric project in terms of annual electricity generation. Sitting on the Yangtze river (the longest river in Asia), the dam generates power, provides flood control and allows navigation for ships traveling along the river. Construction of the Three Gorges Dam began in late 1994 and was scheduled to take around 17 years to complete. During construction, 102.59 million cubic meters of earth had to be removed to make way for the giant structure with around 1.24 million residents having to be relocated. It is estimated that 27.15 million cubic meters of cement and 463,000 tons of steel were used to build the dam. In 2006, the body of the dam reached completion and the facility officially opened two years later in 2008. It would be another four years until the Three Gorges Dam was fully operational in 2012 when the last hydroelectric turbine ended the testing phase and began production. The construction cost is estimated to be anywhere around ¥180 billion ($26 billion). The Three Gorges Dam now stands at a height of around 185 m (606 ft) with a length of around 2,335 m (7660 ft.) The reservoir created as a result of damming the river has an estimated surface area of around 1,084 square kilometers (when at its normal depth of 175 m) holding up to 39.3 cubic kilometers of water. As of 2012, the Three Gorges Dam has an installed power capacity of 22,500 MW (22.5 GW) making it the world’s largest hydroelectric power station in terms of generation capacity. This enormous capacity is achieved as a result of the 34 generators installed in the facility. Out of the 34 generators, there are 32 main generators (each having a 700 MW capacity) and two smaller generators that are used for powering the facility (both with a capacity of 50 MW). This provides us with the 22,500 MW of installed power capacity. There are many different environmental impacts of hydroelectric dams and the Three Gorges Dam is no exception to the rule. During construction of the dam, an area of land covering 632 square kilometers was submerged to form the reservoir. This vast expanse of land was home to various endangered species whose habitats were destroyed as a result of the flooding of the reservoir. Stemming the flow of a river (as hydroelectric dams do) affects the flow of sediments and nutrients that can be vital for supporting the integrity of a river further downstream. This can lead to an increased risk of flooding and erosion further downstream whilst also impacting on biodiversity. Erosion on the banks of the reservoir has also been observed and can be attributed to the rising water levels. Whilst the largest hydroelectric dam in the world is bound to have a significant impact on the environment, it also has positive impacts on the environment due to the capacity of clean energy it is able to produce – energy that might have otherwise been produced through the burning of fossil fuels. Over the three year period of 2012 to 2014 the facility generated an estimated 93,390 terawatt-hours (TWh) of electricity each year which is more than double that of the largest fossil-fuel powered facilities in the world and almost a third more than that of the largest Nuclear power stations in the world. 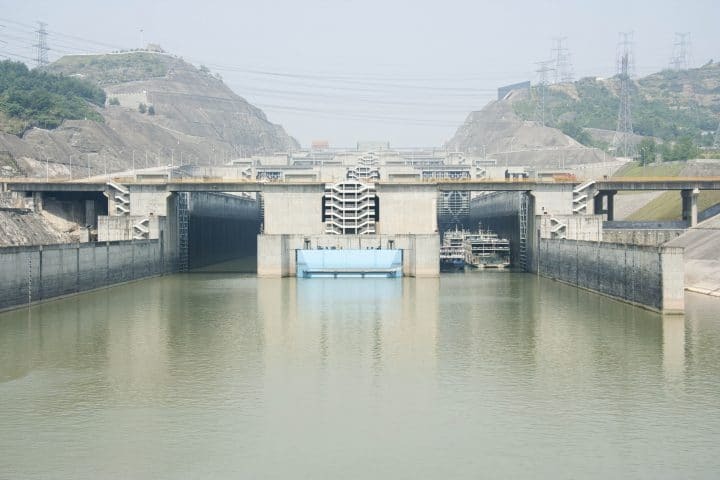 The reservoir of the Three Gorges Dam has a flood storage capacity of around 22 cubic kilometers of water which provides a level of flood control for areas of land further downstream. The Yangtze river is prone to seasonal flooding and as a result, the flood storage capacity of the dam is estimated to reduce the frequency of major downstream flooding from once in every ten years to once in every 100 years by holding back large volumes of flood water and releasing it slowly over time. During the initial planning stages of the dam, it was deemed necessary to implement structures that would allow ships to continue to use the river for transporting both cargo and passengers. As a result, two options for navigating the dam have been implemented. The installation of vast ship locks at the Three Gorges Dam has made navigating the dam a breeze. Depending on their size, several ships are able to fit into each lock at any one time, helping to reduce delays in navigating the dam. As pictured above, two ship locks are installed side by side and comprise of five stages. The average time from entering the first lock to exiting the final lock is around four hours. A later addition to the Three Gorges Dam is the introduction of a ship lift that will be capable of elevating/de-elevating vessels of up to 3,000 tons. The key benefit the ship lift has over the ship locks is the speed at which it operates, reducing the time it takes for a vessel to navigate the locks from 4 hours to around 40 minutes. The ship lift began construction in 2007 with completion estimated for the end of 2014. There are several concerns over the Three Gorges Dam due to its location, scale, and importance. Concerns were raised shortly after the reservoir was filled for the first time when several hairline fractures were seen in the structure of the dam. This was however later deemed to be within limits and the facility received a good quality rating from a group of experts. Another concern is that the Three Gorges area lies on a seismic fault and therefore could be more prone to earth tremors of a significant magnitude. The issue of national security has also been raised due to the vast numbers of people who live and work in areas downstream which could be devastated by any breach of the dam. China Three Gorges Corporation – Information on the Three Gorges project from the China Three Gorges Corporation.